The Mexican Center for Research and Advanced Studies of the National Polytechnic Institute (Cinvestav, according to its initials in Spanish) has awarded an honorary doctorate to Dr. Mateo Valero, Director of Barcelona Supercomputing Center. The ceremony took place at 12pm on Monday, 11 September in the Auditorio Arturo Rosenblueth, Mexico City. The honorary doctorate was presented by Dr. Pablo Rudomín Zevnovaty, Professor Emeritus of the Physiology, Biophysics and Neuroscience Department at Cinvestav, who had nominated Dr. Valero for the academic award. 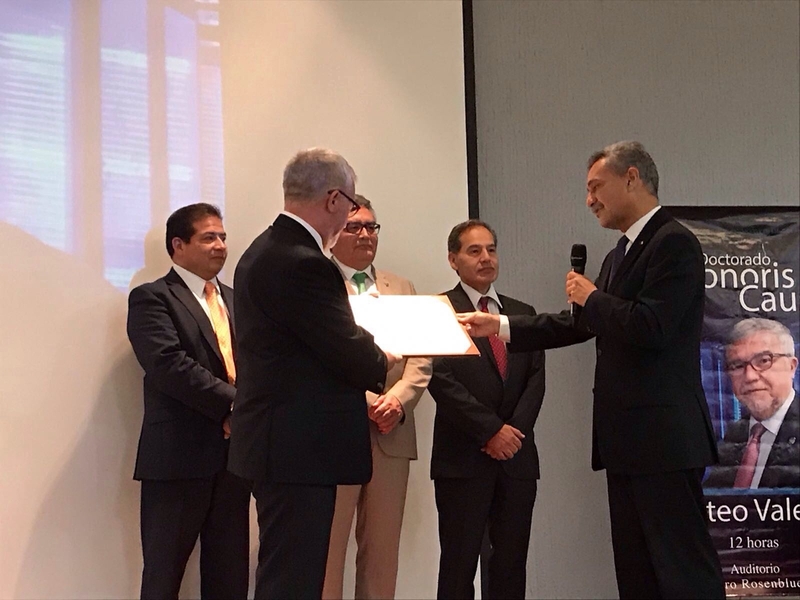 The doctorate was awarded in recognition of Dr. Valero’s excellent work in all aspects of supercomputing development and research, in particular his collaboration in driving forward supercomputing in Mexico. Cinvestav Director José Mustre de Léon was also at the event, which ended with Dr. Valero’s keynote speech, titled “From Classical to Runtime Aware Computer Architectures”. The Center for Research and Advanced Studies of the National Polytechnic Institute (CINVESTAV) is a public institute in Mexico dedicated to the advancement of science, technology and education at postgraduate level. It began operation in 1961 under the direction of the Mexican scientist Arturo Rosenblueth Stearns. Its mission is to make a major contribution to social progress through cutting-edge scientific and research and technology, as well as training a high-quality workforce. At CINVESTAV 583 research projects are being undertaken in different knowledge areas, organised into the following four departments: Exact Sciences, Biology and Medicine, Engineering and Social Sciences.